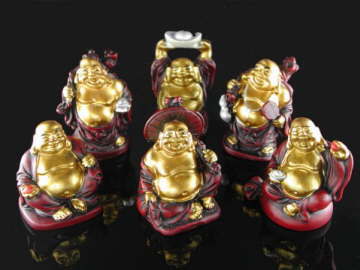 This set of resin Happy Buddhas symbolise six different energies: wealth and recognition, longevity and good health, good fortune and happiness, happiness and celebration, wealth and financial success, and prosperity and joy. Feng Shui is about harmonising our environment and this lovely set of Happy Buddhas can be placed throughout your home or working environment to encourage abundance in all aspects of your life. A perfect gift for you or your friends and family.